Bitcoin price fell yesterday, and also price of ethereum is going down. Bitcoin investors thinks that falling will be go on and both cryptocurrencies are poised to extend losses. How much falling happened in Bitcoin? US GDAX exchange tells us that Bitcoin/USD fell to $2,359, down $280 this week. Bitcoin has edged its lowest point since reaching an all-time record high of $3000 achieved in this June. Some economy expert analysts: expect btc to surpass its all-time high but not before dipping below around 1850 - 1900 dollars. 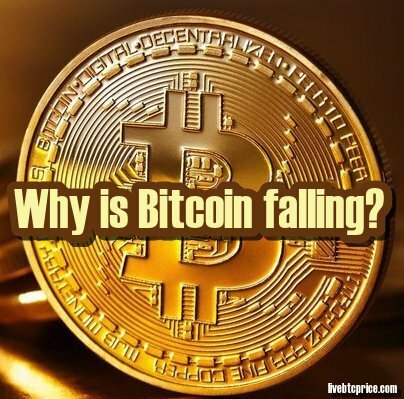 Is the falling the end for Bitcoin? Some bitcoin experts think that "a big hand" somebody took his money from cryptocurrency world in a huge amount like 15 billion dollars. According to them, this event can cause this falling. Goldmanc Sachs: Sheba Jafari, the head of technical strategy at Goldman Sachs, wrote that 'there’s potential (Bitcoin) to extend as far as 3915$' but he warned that the current period of correction could see the digital currency fall to 1857 dollars. Ethereum followed bitcoin’s move, falling to 199 dollars, down 13%.